A radical new approach to blending comfort and performance, the Diavel combines lightweight agility with exceptional sporting characteristics, resulting in a truly commanding new motorcycle. Continuing the technological standard recently set by Ducati’s own Multistrada 1200 S, the Diavel features Ducati Traction Control, Ducati Riding Modes (Sport, Touring and Urban), Ride-By-Wire throttle and ABS brakes that combine to deliver the most dominant ride available. 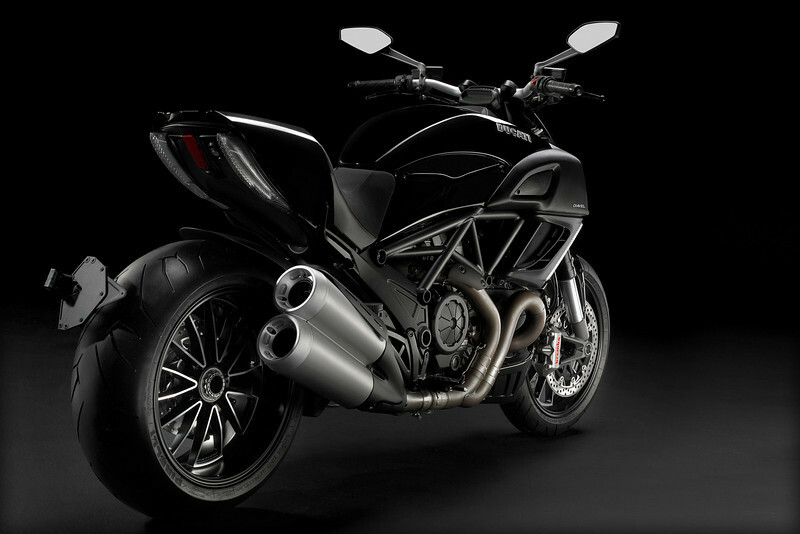 The lightweight and sleek Diavel weighs approximately 450 pounds. With strategic design in mind, the Diavel features excellent handling and an unmatched sense of confidence and control, while embodying a nimble athlete on the starting blocks. The Diavel’s comfortable ride features one of the lowest seat heights (30.3in) in the Ducati range as well as wide tapered aluminum handlebars beautifully shaped to fit the lines of the bike. Other technological advancements include LED lighting, keyless ignition and LCD split-level instrumentation with a TFT control panel display. Developed from the world champion Testastretta Evoluzione Superbike engine, the Ducati Diavel comes equipped with the Testastretta 11° power plant, able to harness the power of a Superbike yet produce a smooth ride, which can be adapted at the press of a button. Via the Ducati Traction Control system, the Diavel offers eight levels of traction sensitivity, which significantly increase the bike’s active safety and performance levels. 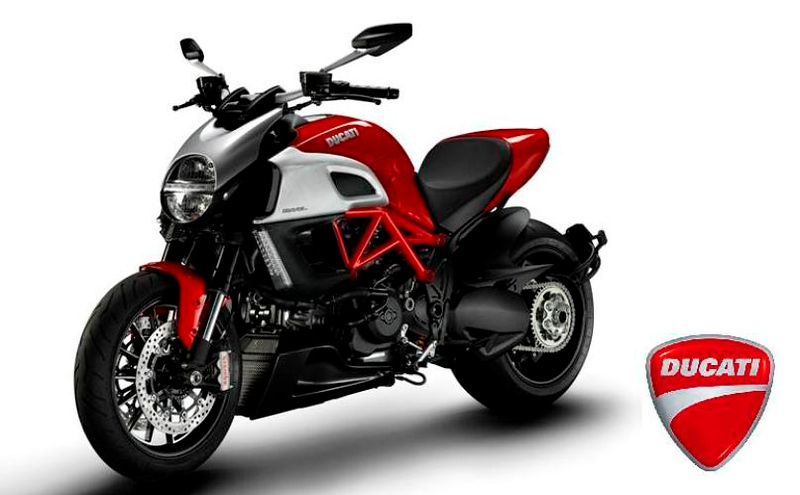 What’s more, the Ducati Diavel boasts 162-horsepower in Sport and Touring modes for an adrenaline-fuelled ride, or 100 horsepower in Urban mode for a more relaxed experience. 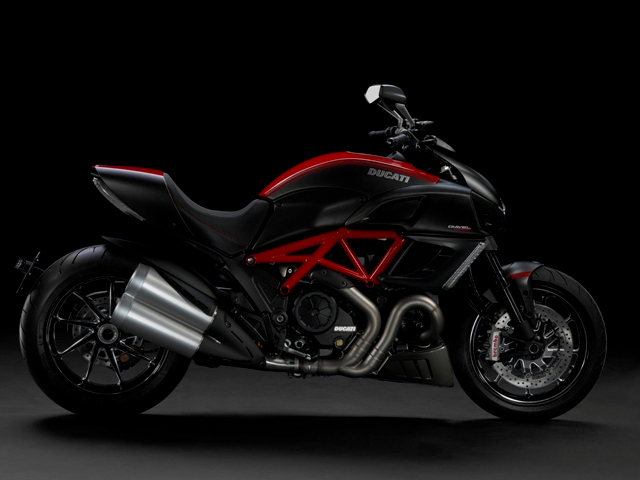 The Ducati Diavel was originally going to be available in two versions: the Diavel, $16,995, and the Diavel Carbon, $19,995, featuring a body formed entirely in carbon fiber, and forged aluminum Marchesini wheels that shave 5.5 pounds of unsprung weight from the motorcycle. But in response to feedback from motorcycle show visitors, Ducati recently announced the addition of a stunning diamond black color scheme for the new 2011 Ducati Diavel. With the Diavel receiving consumer attention at motorcycle shows around the globe, Ducati collected feedback from passionate motorcyclists viewing the bike for the first time. The new diamond black color option is the result of immediate response to customer demand. While the Diavel Carbon was overwhelmingly loved alongside the Diavel in traditional Ducati Red, the black livery replaces the originally presented white offering. The new black scheme will also be further enhanced with a black anodized headlamp body and lateral air intakes. The new black diamond color has already been incorporated into production plans and will be available alongside the entire Diavel range this February at authorized Ducati dealerships.